The Federal Trade Commission (FTC) is proposing several changes to its Energy Labeling Rule affecting labels for various household items and appliances. The current rule requires manufacturers to attach a yellow EnergyGuide label to covered items. 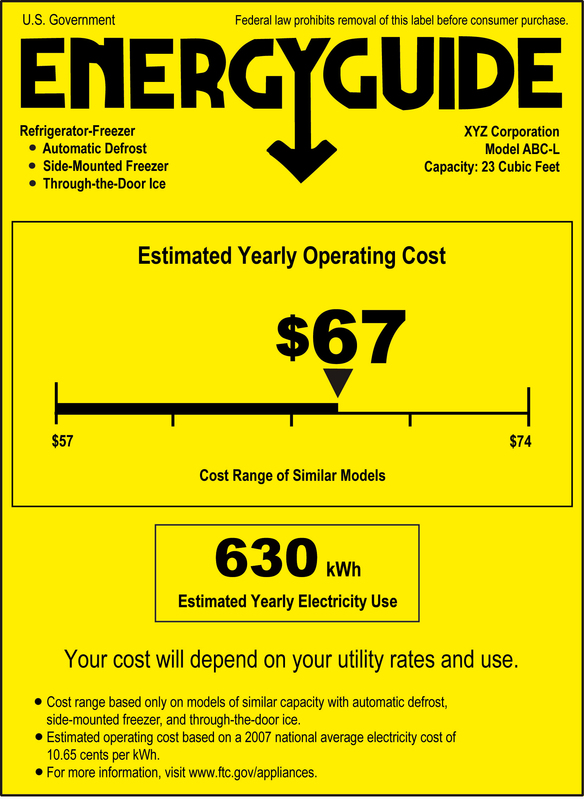 In addition to an energy consumption rating, the labels, which appear on items including refrigerators, air conditioners, and televisions, state estimated annual operating costs and show a range of energy consumption for similar models. According to the FTC’s Press Release, the current amendments propose “expanded light bulb label coverage, an online label database, more durable labels for appliances, room air conditioner labels on boxes, improved ceiling fan labels, consolidated ranges on refrigerator labels, and updates to furnace labels.” Specifically, the FTC proposes expanding the light bulb labeling requirements to decorative and specialty bulbs; updating ceiling fan labels to follow the EnergyGuide label format used on other products; and consolidating ranges for refrigerators into three categories to facilitate comparison shopping by consumers. The proposed online label database comes in response to requests by several organizations that paper labels be replaced by an online system. The Association of Home Appliance Manufacturers and BSH Home Appliance Corporation reported to the FTC that two-thirds of consumers conducted online research prior to buying appliances. The FTC proposal would require manufacturers to submit links for covered product labels, but would not remove the paper labeling requirements. The new system would also provide online retailers with digital labels to be used in advertising, and would allow brick-and-mortar retailers to print replacement labels for in-store items. Because manufacturers must already display online labels for covered products, the FTC believes that the proposal will not create a significant burden. The proposed amendments reflect the FTC’s continuing efforts to help consumers choose and purchase higher efficiency appliances and cut down on energy costs. Written comments, which must be received by August 18, 2014, can be submitted here.